While not necessarily the case in fact, for many, the heart and soul of the 2018 Eastern Conference Finals between the Boston Celtics and Cleveland Cavaliers would be decided in Game Five. For Boston, home court advantage has been the deciding factor, with the team going nine wins and zero losses on their home court. Would it be enough to keep control of the series? The thought of going down 3-2 to the Cavaliers with Game Six set to take place in Cleveland not being a pleasant one, an extra sense of urgency permeated the building, and was evident in how both teams approached the game from the earliest moments. As usual, the ambient noise at TD Garden was deafening, and the atmosphere supercharged even before tip-off. The Celtics won it, but Jaylen Brown missed the opening shot, with Kevin Love putting the Cavs up two to start things off. Terry Rozier answered right back with a three, keeping the crowd in it and looking to have prevented and early Cleveland run. Boston looked to take an early lead, but Love kept Cleveland close, hitting multiple treys and retaking the lead at the eight-minute mark at 11-9. Al Horford's early aggression against Tristan Thompson and a trey from Jayson Tatum soon put Boston back on top, however, and Aron Baynes started to give the Cs some separation. An old-school three-point play by LeBron James threatened to erase that cushion, but Marcus Smart hit the newfangled variety to force a Cleveland timeout at the 3:40 mark. Tatum added a pair from the stripe and Mook Morris three to give the Cs a 24-15 lead. LeBron and Love shaved the lead down to eight, but Tatum and Brown would push the lead to a game-high 13 points to end the first quarter. The second frame began with a bit of sloppy play followed by a Baynes tip-in, then nearly erupted into a fistfight after Larry Nance Jr. shoved Morris after falling down on a play Mook may have taunted him (poor baby!) while he was down. Both would be assessed technicals (because trash talk is on the same level as shoving someone with their back to you). Kyle Korver, Nance and Jordan Clarkson then proceeded to chip into the lead, cutting it to 39-31 with 8:40 left in the half. Some truly awful basketball ensued after, with neither team able to hit anything for several possessions. 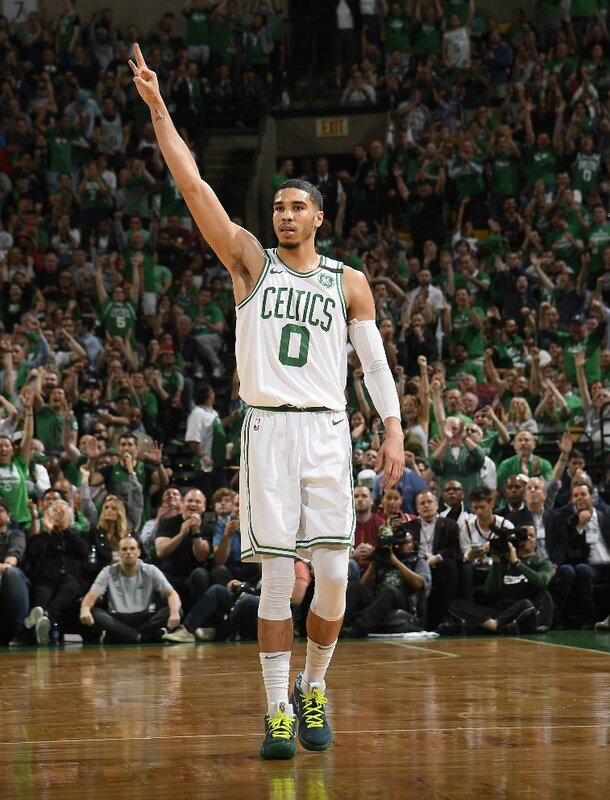 Horford got himself to the line for two after what seemed like an eternity, and Tatum hit a trey with five left to put Boston up 44-31 to tie the game's biggest advantage. LeBron began to heat up late in the half, but Morris and Smart kept the Cavs from erasing too much of the lead, with Smart forcing a timeout after a pair of buckets on back-to-back plays. Hill would get to the line with just over a minute left, hitting both, and a layup by LeBron cut into the Celtics' lead to 53-42 going into the half. The third quarter began with Brown and James trading baskets, with Tatum throwing in a three for good measure, driving the lead back to 13. Jaylen would add a pair from the stripe, putting the lead at 61-46 with eight to go in the frame, but Love, JR Smith, and Hill would chisel away at the lead, cutting it back to 11 at the 6:40 mark. Mook would slow the attack with a circus-shot layup where he looked to have been hit in the head, and Smart would put Boston back up 15 with a trey on the Cs next possession. Despite looking noticeably tired, James kept up his assault, getting to the line on a drive and converting. JR Smith continued being trash, however, interrupting James' effort by sending Tatum to the line with the world's most obvious push and killing LeBron's effort. Tatum made both, and despite Love and former Celt Jeff Green making buckets, Horford and Tatum negated them with makes of their own. Another wild layup from Smart to Morris pushed the lead to the new high of the game, 76-60. Yet again, both teams turned out two full minutes of awful basketball, turning the rock over repeatedly and missing the broad side of a barn door and everything else for the rest of the frame. The final quarter started with more bad play, but Brown would finally connect nearly a minute into the frame. Clarkson would respond with a jumper, but Smart would connect on a three on the next play and Brown would get to the line to push the lead to 83-62 with ten left. Korver and Green would cut into that lead, including a trey on an assist by the former to the latter to cut the lead to 83-71 Boston with 7:50 to go. Both teams continued playing sloppy, with two more full minutes of game time passing without a field goal, as much of an effect of Boston's home defense as both team's obvious exhaustion. Horford would connect on an oop from Scary Terry to end the mess, and Rozier and Horford would push the lead to 90-73. The Cavs threw the towel with three left in the game, with LeBron checking out, looking completely gassed. Tatum and Hill made trips to the line, and Rodney Hood and former Celtics draftee Ante Zizic garbage time buckets, but the game had long been decided, with Boston taking the night 96-83 and going up 3-2 in the Eastern Conference Finals. The Celtics now threaten to eliminate the Cavs at home this Friday night at 8:30 EST.